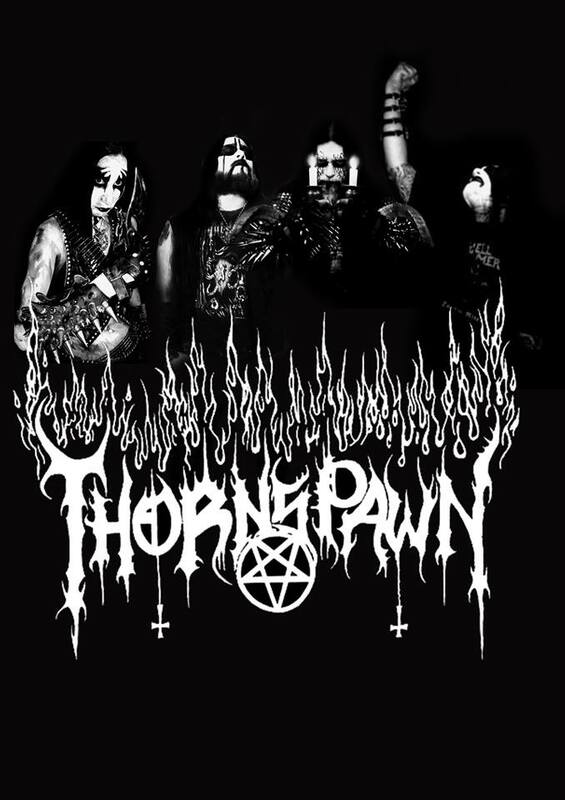 Veteran black metal band, Thornspawn, currently locates in Mexico, was originally spawned from San Antonio, Texas back in the 1993. Despite having a lot of struggles, location and lineup changes, the band is still alive and rapidly spreading the fiendish conflagration that was started over two decades ago. Apart from three imprecatory LPs, numerous eps, demos and splits releases are part of their discography. Blackthorn (Vocals and Drums) who is the only remaining monk from the oldest line up, is leading the band with the association of his wife, Hella (Bass) and two other guitarists, Moon and Dod. Blackthorn and Hella have joined with us to answer our interview questions. Let us see if they are going to reveal anything about the new releases, perhaps about the long awaited full length. The interview is also going to focus on a lot of incidents related to the past of both Thornspawn and Blackthorn. Diabolical Greetings!!! Blackthorn and Hella, It has been an honor for us to welcome you in Venustas Diabolicus Zine. I have heard that you and your family members had some sorts of brawl with mafia members, who tried to extort your business and also threatened to kidnap your children. Blackthron and Hella: 5 in prisons and 2 found decapitated. It is good to have friends in the lowest of places. Now let’s move on to the history of the band. Thornspawn has begun erupting since 1993 and definitely a prestigious act in the underground extreme metal scene. Please inaugurate about Thornspawn to the readers who have not heard of you yet. Blackthorn: To enter the history of Thornspawn, it would only be time consuming. I tend not to focus on the past; it takes away from the now. I will simply state that we have existed for many Millennia, in other life or lifeless forms. A FOUL AND SURREAL ENTITY THAT SWARMS WITHIN THE KAOS VOID. I have observed something interesting on your current lineup and it is all of the members of Thornspawn also play in Maledictvs. All of the members of these two acts are mutual. Please enlighten our reader about the fiendish music of Maledictvs as well. I assume that Hella has initiated the journey of this sinistrous act. BT: MALEDICTVS IS HELLA,HELLA IS MALEDICTVS . Those that assist her malevolence are for live purposes or capturing her madness via recording/channeling the beyond. That being said, it would be a complete and other worldly interrogation. TO DWELL IN TO THE MIND OF A WITCH. Regarding the current line-up of Thornspawn, is there any member involved in writing lyrics or composing music apart from you, Blackthorn? Brief us about the song writing process of Thornspawn. Do you write the lyrics before composing the structure of the music or do you put the lyrics after the completion of the whole composition? BT: For some time, I and Hella are the only persons involve in writing materials for the band. Yet, there are some Germanic Transmissions being received by ’Session” members, but at this time no information about it can be divulged. There is no formula or precise method in the process of lyrical manifestations. It is the Study and Meditation of the Void that opens Paranormal Insight. We have left behind the fairy tale of the Christ Child, Carved our faces with the images of the Dark Lords. Before any organism crawled, flew or walked in and out of the ancient black earth. How well was the response you received from the listeners about your last split, “Sacrilegious Unification Spawn of Abominable Darkness & Hate” with Singaporean black metal horde Istidraj. Notify us that how the idea of releasing split with Istidraj got spawned? BT: That release was actually to be done with the mighty Thorns of Hate. Md Adlan consecrated this banner of black/death with the tile of the split, but before we could unleash this, T.O.H. was disbanded. Ian of Istidraj and I had been in contact for many years and had planned for a split, but due to band conflicts from each side, we could never seem to be united as planned. Until now, we have received mixed responses about the split as it always happens. Some Positive, Most Negative, but that is what always feeds my hate. Over the last seven years, after the release of “Sanctified by Satan’s Blood”, Thornspawn has not released any other materials apart from the splits. Can we expect any full length soon? If there is a plan of any new releases, kindly do enlighten us about the concept, sound and related details of the new album. I have already had a full length in my possession for years, but due to delays with the lineup problems, incompetent labels, etc., it gets held back. And after a while the materials seems to lose its luster, and I scrap it all. We have signed to Apocalyptic Empire Records (Nor), but the label is delaying the time of the release. Another setback. I can say that there is no longer any “Conceptual” objective in this release or any future Thornspawn releases. Maybe in the past there was, but with time one must return to the origin. It is the devotion to the stellar and abysmal Gods. Blackthorn, are you in touch with the old mongers of Thornspawn? How is your current relation with Swornghoul, Lord Necron and others? BT: I have no contact with any of them or the past members, nor I do care about to have a contact. The kaos demands new blood to be shed upon the altar, to embrace the dark energy, to feel no remorse for those that feel on weakened limbs. Are you currently signed with any label? Previously you used to work with Giant labels like Osmose and Agonia? How was your experience in terms of working with the big labels? BT: As stated above, we are signed to AER, but contact is at a standstill. Working with labels such as JEWGONIA & O$MOSE were a learning experience. What did I learn you if you are asking………. TRUST NO ONE!!! From the beginning you are very selective in playing live gigs. 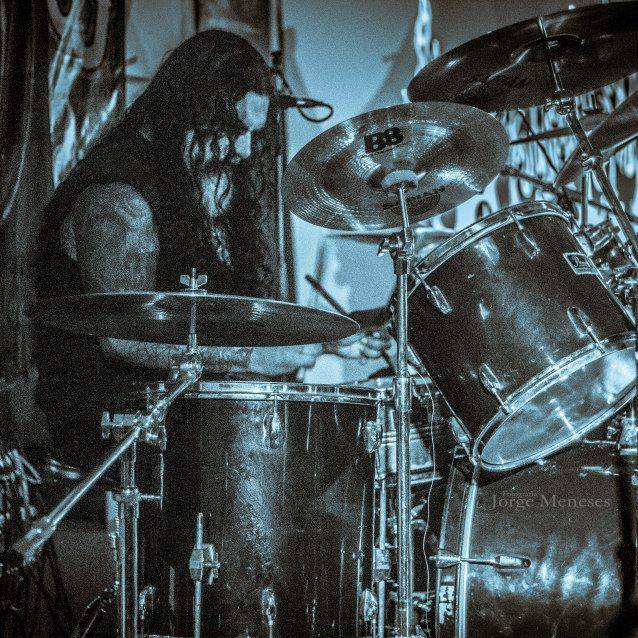 Have you ever refused the offer of playing live in any of the commercial metal festivals? BT: NONE WHAT SO EVER, WE DON’T GET ASKED BECAUSE WE DO NOT CARE FOR THOSE TYPE OF BRAINLESS FESTIVALS. Do you want to share anything from the latest tour with Archgoat? BT: It was a great memory seeing my brothers of mighty Archgoat, in Mexico of all places! Both bands slayed that night, and the demons raised high their horns in praise and servitude. But the high light of that entire experience was the very private after party Bbq. With a great feast, cold beers, fire breathing tequila, and a private performance by upcoming blues singer Lucas Woller for us all that night. It was such a personal and private moment that we all to this day talk about. It always happens that when I and the Archgoat guys get together I end being the chef for the band every time. Blackthorn, do you prefer handling the vocal and bass deliveries or vocal and drums deliveries in live show? Isn’t it a bit harder to handle the vocal and drums duties together in a live onslaught? BT: It has always been since the beginning that I sit at the master’s throne. I had tried before to execute bass and vocals, but it was not my calling. It is not relevant that these tasks are difficult; it is actually my will and oath that I be the Weapon of Choice by the Masters. Hella, you have the experiences of handling the vocal deliveries in other projects. Is there any scope to see you doing the vocal duties (as a part time or full time) of mighty Thornspawn? Hella: I have assisted on backing vocals for some of the songs on several splits, but Blackthorn is the Roar and Jaws of Hades. I shall help where I am needed, live wise or in any other forms. 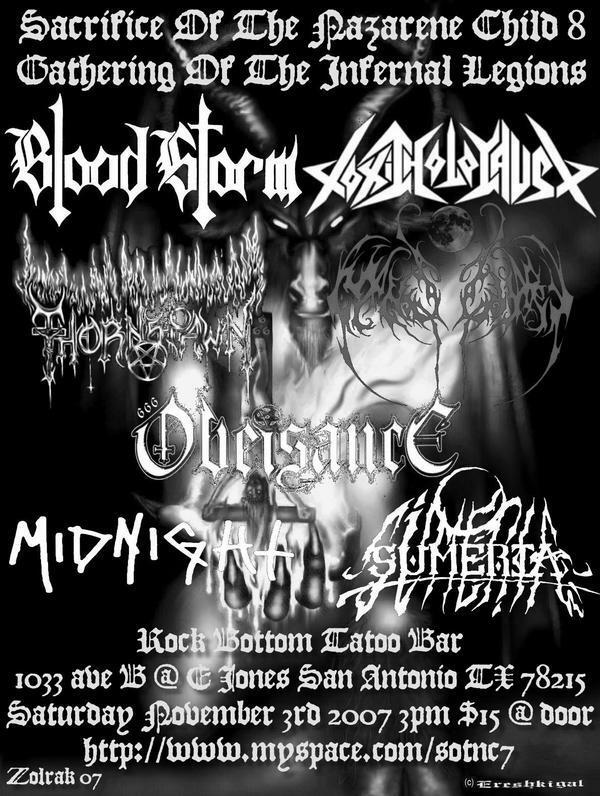 Blackthorn, you were one of the organizers of the “Sacrifice of the Nazarene Child”, one of the darkest Black Metal Fest that used to held in Texas (Probably from 1998-2010). 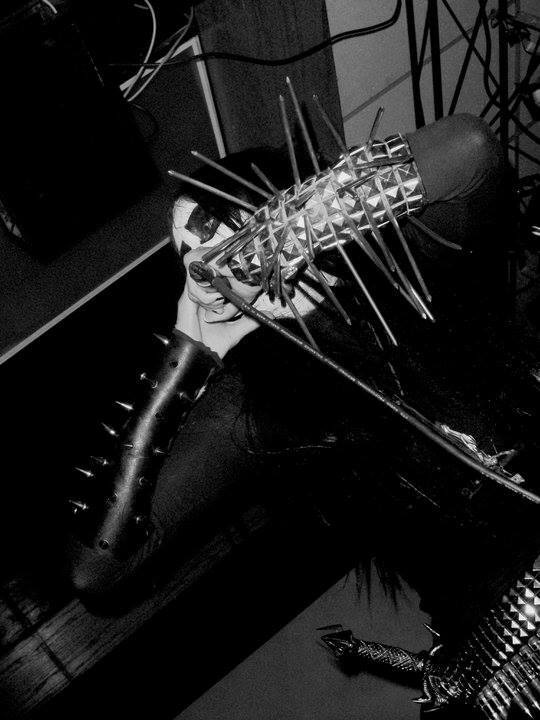 Tell us about that nefarious black metal fest and it was once considered as the one and only true black metal fest of United States. Do you have any plan to reincarnate that malicious fest? BT: I was the sole organizer of this fest my friend!! The fest began as a local/state wide fest with 60 people attending. By 2001, the number went up to 350 people and at that time there was n fest like this. Sure there was Milwaukee Metalfest, but this was more of a family gathering. The people that attended would bring more people on the following year. The people that attended would bring more people the following year. The fest grew of its very private and ominous vibe by word of mouth, where you could see very exclusive bands gather with likeminded objectives. This fest was by invitation only. Trust me in the end I made many enemies because I wouldn’t let just any band perform. 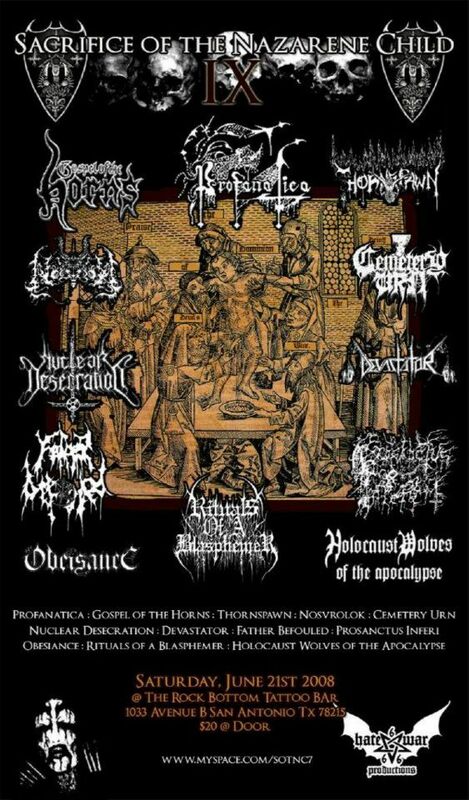 Here are some of the bands that played my fest: Absu, Archgoat (First and only performance in America since their reunion), Inquisition (First USA show), Demoncy, Noctuary, Black Witchery, Sadistic Intent, Kult ov Azazel, Profanatica (First show in 13 yrs), Father Befouled, Cemetery Urn, Gospel of the Horns, Toxic Holocaust, Midnight, Nightbringer, Prosancus Inferi, Infernal Oak, Gnostic, Thornspawn, Incursus, Blood Storm, The Chasm, Imprecation, Morbus 666, Nuklear Desecration, Obeisance, Khisanth, Kathonik, Unchrist, Bahimiron, Demonhammer etc. were some of the bands that shared their sonic torment. Now, I will like to switch an old topic here. 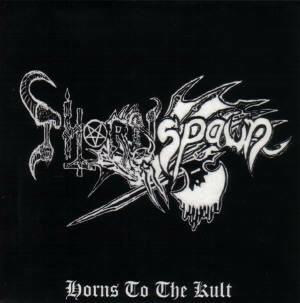 It is about the “Horns to the Kult” EP where Thornspawn’s logo was portrayed as a mixture of the logos of Beherit and Necrovore. Who did that awe-inspiring mixture of the logos? Do you have any plan to release any other album, by giving a tribute to your influences? Thornspawn has been spreading the wicked diseases of raw black metal since 1993. Many of your contemporaries have gone too far by reaching into mainstream exposure. Yet, you have also worked with some biggest extreme metal labels, but you have always remained yourselves in the catacomb of underground. 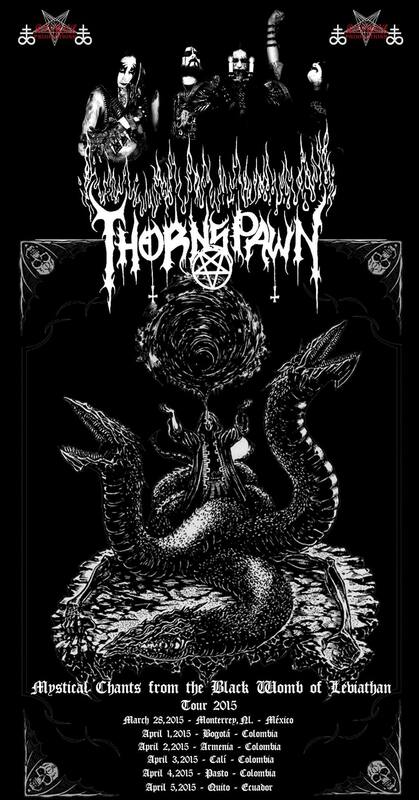 I do assume that the motto of Thornspawn is to create the truest form of black metal music by remaining in the underground. Would you please elaborate this issue? BT: I have seen the downfall of many bands I used to respect. They considered it as a mean of support by whoring their respected dark art to gain fame or status or simply join a new wave or hype. I think that is why I end up changing labels often because I refuse to conform or allow anyone including past members dictate or decide for me. With the focus on the music I can’t say that I consider my music as the blue print or the truest of expressions in this infernal pact, but my devotion and teachings guide this inner being to remain the only path to higher will and strength. We have reached to the culmination of our unholy conversation. Any announcement or statement you want to spread before ending up the interview? BT: Be hailed for the support/belief my friend. We are preparing to leave in a few weeks on our “Mystical Chants from the Black womb of leviathan” tour 2015 over Mexico, Colombia & Ecuador! Contact me through facefuck or infernalhorde@hotmail.com.